The Daily Report published an article about high-profile political law and litigation boutique Strickland Brockington and Lewis on closing its doors and are joining Taylor English Duma LLP. ATLANTA, November 30, 2018 – Taylor English Duma is pleased to announce that L. Craig Dowdy has joined as a partner in the Litigation practice group. Dowdy will also serve as Director of Utilities and Regulated Industries for Taylor English Decisions, the business consulting and government affairs subsidiary of the firm. 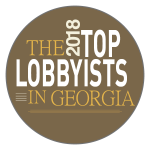 ATLANTA, September 10, 2018 – Taylor English Decisions LLC, a business consulting and government affairs subsidiary of Taylor English Duma LLP, is pleased to announce that James Magazine has ranked the firm seventh on its list of Top 10 Governmental Affairs firms associated with a law firm. Taylor English Decisions LLC, the business consulting and government strategies affiliate of Taylor English Duma LLP, is pleased to announce the additions of Ashton Harper and William Woodall to the firm’s Government Affairs practice. Metro Atlanta CEO published a video of Earl Ehrhart discussing Taylor English Decisions, a purpose-built business consulting and government relations firm.